Bees might look like simple creatures. But don’t let that fool you. Dr. Olav Rueppell, associate professor of biology, has spent years examining their social behavior: Why do certain worker bees live longer than others? Why do diseased worker bees remove themselves from the hive? Why do some bees forage for pollen and some for nectar? Basically, it comes back to that age-old question – nature vs. nurture. Or, even better, how do nature and nurture interact? I’m sort of a generalist, picking apart various aspects of honeybee biology. The steady decline of honeybees – known as the Colony Collapse Disorder – has also led Rueppell to look at health issues such as the effects of pesticides on intestinal stem cells in bees. Another health issue involves a parasitic mite, Varroa, which transmits disease. He is studying how the native honeybees in Thailand have developed resistance mechanisms against the mites. 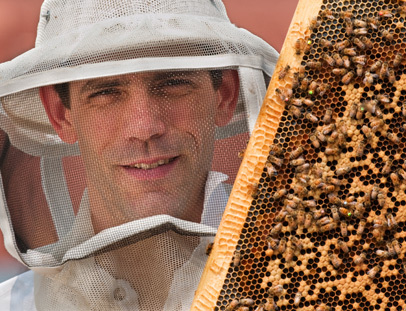 “I’m sort of a generalist, picking apart various aspects of honeybee biology,” he says. Other areas of research include genetic diversity in colonies, the consequences of social evolution, reproductive traits and aging. Aging in honeybees, in particular, is fascinating because the tasks assigned by group living influence how long the bees live. For example, worker bees have short lives compared to queens. But other factors can play into how long those workers live. Those who live in small colonies live longer than those in large colonies. “Nurses” who have less brood to rear live longer as well. Finally, the age workers begin to leave the hive and forage has the strongest effect on longevity. Foraging usually signals the beginning of the end for bees. It’s their final task in life. But it’s not all cut and dry. Genetics play a role in how early bees begin foraging and a build-up of a behavioral affector protein may just be responsible for nurses of smaller broods living longer. So the next time you see a bee buzz by, realize that it’s doing more than pollinating. It’s teaching us about the interplay of genetics and environment.